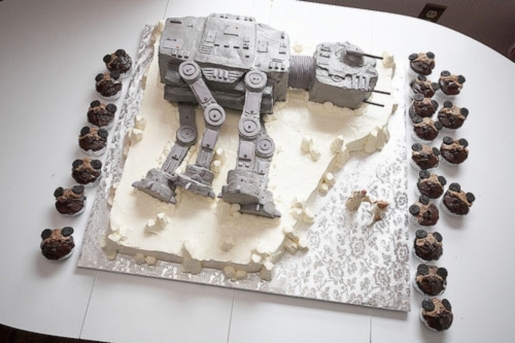 In honor of the Sci-Fi Channel‘s (now called Syfy) 17th birthday, the folks at Sci-Fi Wire put together a great gallery of 17 awesome-looking sci-fi cakes. Now, those are some seriously awesome cakes, but not all cakes turn out so good. After all, there’s a reason Jen Yates started the brilliant website Cake Wrecks, which celebrates the worst achievements in the baking and confectionary arts. Neatorama has a great interview with Jen to check out if you’d like to see the person behind one of my favorite websites. It’s interesting the dichotomy you can get with decorated cakes. Some of them are incredible. Some of them are horrible. A lot of it is kind of luck of the draw when it comes to who prepares the cake at the bakery when you pick it up. When I worked at the grocery store, one of the people who I went through orientation with was a baker whose main job was to decorate and design cakes. She was incredible at it! I’ve always kind of wondered just why cake became the celebratory food of choice. Why not candy? Better yet, why not pie!? Everyone loves pie! Everyone loves free pie, and it’s really hard to pass up even if you’re not hungry. A hot piece of pie, fresh from the oven and smothered in ice cream? Heaven. Absolute heaven.